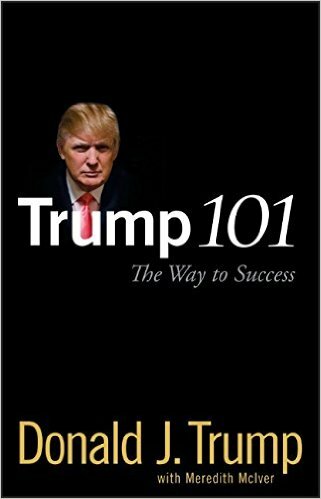 Click here for 20 full quotes from Donald Trump in the book Trump 101 by Donald Trump. Trump University might become the biggest scandal on the Republican side in the 2016 general election, so OnTheIssues looked at the facts beyond the media hype. This book is Donald Trump�s introduction to Trump University: about the school, its methodology, and his involvement. We�ll review the content and context of this book; we�ll also review the 2016 issues and controversy regarding Trump University. The existence of that list might come as a surprise to Trump�s critics, who claim that Trump University is not a �real university.� No, it�s not � that was settled by a lawsuit by the State of New York in 2005; the state sued Donald Trump over the unauthorized use of the term �University� � the name was changed at that time to �Trump Entrepreneur Initiative� (but everyone still uses the term �Trump University,� so we will too). Trump University was never a college with buildings and campus � but it did have textbooks, and teachers, and students who valued what they learned there. Alas, Trump University also had some dissatisfied students, as does every institution. And those dissatisfied students filed a lawsuit, claiming that Trump University�s high-pressure sales tactics made them more a multi-level marketing tool than an institution of higher learning. That lawsuit was filed in 2010 and is still pending in 2016 � with Donald Trump trading barbs with Judge Gonzalo Curiel about the judge�s bias (Trump claims that, because of Judge Curiel�s Mexican heritage, he should recuse himself, since Trump�s campaign stances against Mexico mean that anyone of Mexican descent would be biased). There is a third lawsuit, too, filed in 2013, also still pending and also overseen by Judge Curiel: a class-action lawsuit which forced the release of Trump University documents. The two ongoing lawsuits, especially the release of otherwise private documents, should provide fodder for the feeding frenzy of the mainstream media for the entire duration of the general election campaign. But politically, the whole scandal is equivalent to the Hillary Clinton email scandal: yes, there is potential for indictment and a trial, but politics overwhelms any legal issues. The mainstream media feeding frenzy IS the story, for both Trump University and for Hillary�s emails. �Coach Trump� section in each chapter, with �coaching� on business-oriented or self-actualization-oriented issues. �Insist on Perfection� anecdotes also in each chapter, citing examples from Donald�s projects of how he insisted on perfection. �A Week in My Life� diary in each chapter, broken down by hours and days, but pieced out a few pages in each chapter. The week in question features the birth of Trump�s child with Melania, so it�s not exactly a typical week, but the purpose is to show that Trump puts in a lot of hours (which he repeats often, such as on p. 146, where he claims to routinely put in 12-hour days). �Ask Mr. Trump,� Q&A from the Trump University blog, with Donald answering questions from readers who are Trump University students or prospective students. A 2-page ad for Trump University appears at the end of the book (pp. 189-90), along with a generous peppering of Trump U logos throughout the book. So is Trump University a scam? No, we don�t think so. It�s likely that 90% of the students who paid to attend were satisfied with the instruction they received; the 10% who were dissatisfied are the ones who joined the lawsuit and who are on TV now complaining. Trump is just being Trump throughout this book � you can read our excerpts and decide for yourself if there�s any wrongdoing involved. Known for "You're Fired!" but it's unpleasant & disruptive. Money is part of your reward for succeeding. In early 1990s, I was $9B in debt; but I never went bankrupt. First real estate deal: 1,200-unit residential foreclosure. Do your research, but then trust your instincts. Learning to be spontaneous takes preparation & practice. Move quickly from seeing problems to seeing solutions. 12-hour working days are my norm, not an exception. I'm deeply and actively involved in Trump University. FactCheck: More than figurehead at Trump U.
Persuasion, not power, is diplomacy at its best. Countries and corporations must both evolve, or fade away. Speak simply & clearly, even when addressing Congress. Passion overcomes many difficult impossibilities. Think on "Trump scale" and make a BIG statement. Many people are afraid to fail, so they don't try. Beauty and elegance are my signature and my brand. Change isn't an admission that you were wrong. Look at people non-judgmentally, without right or wrong. Give others a fair chance, but eliminate scoundrels. by Donald J. Trump and Meredith McIver.